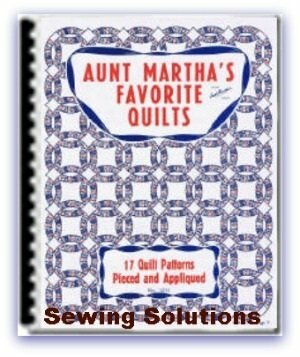 This quilt magazine Aunt Marthas Favorite Quilts has many great patternsAmong these patterns you will find some that date back to the Early American quilt making period. Others are new, modern creations. 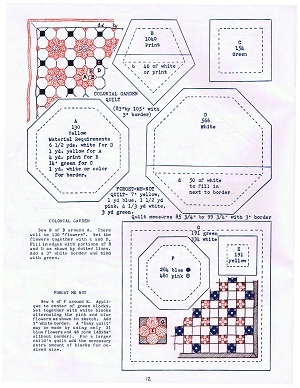 Those who have attended needlework exhibits at fairs have no doubt seen some of these quilts exhibited. Every pattern included is a potential prize winner at such needlework exhibit. 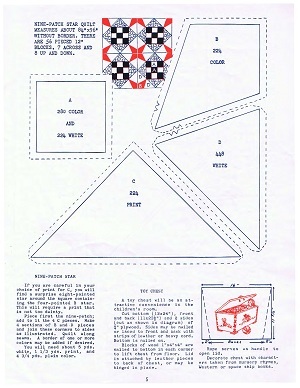 For a "Prize Winning" quilt, design is most important. The selection and combination or materials and colors, the skill of the needleworker and artistic quilting all go to make the quilt a thing of beauty. These are the things which cause the throngs of quilt fans, men and women alike, to stop and gaze with exclamations of ahs! and ohs!. Some of these quilts, to be at their best, should oe made from new materials to get a harmonious effect. Others are just as lovely when made from scraps. As you study these designs you will find that some may be made from very small pieces, while others require larger pieces. In order to conserve the patterns given in this book, we suggest that you trace the various pieces on fairly heavy cardboard. This makes a good, strong cutting guide which can be used many times in cutting out the pieces while the original will be in safe keeping in the book. In all pieces of the patterns given here, ample seams have been allowed. The seam allowances are indicated by broken lines.